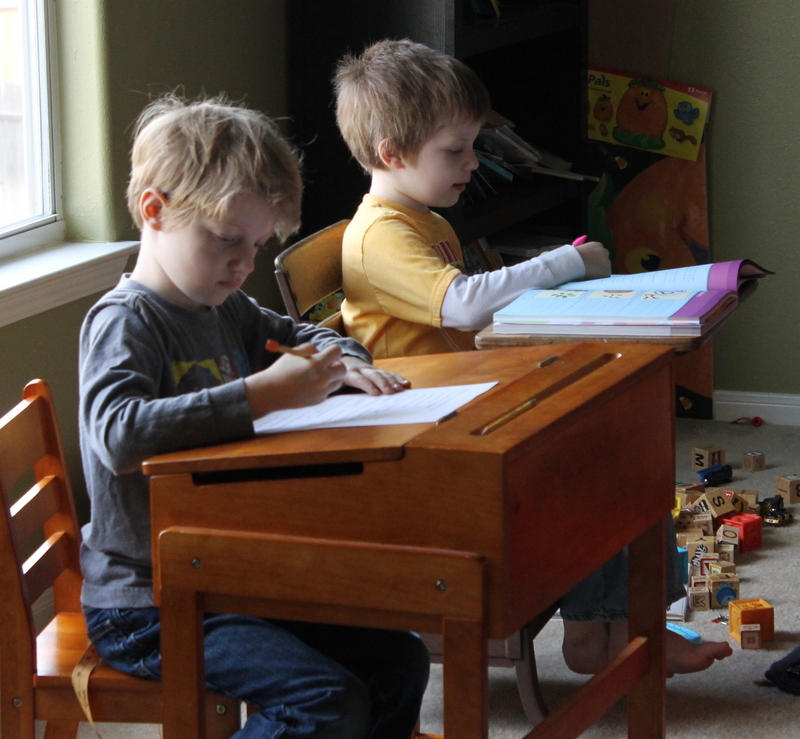 A few friends have asked me about homeschooling…do I like it (I’ll do a pros and cons post soon)? What curriculum do I use? So I decided to do a little example of our homeschool day and what programs/lessons I use. I’ll try my best to give a list of the things I actually purchased and at what level and a little homeschool review for each. Let’s start, shall we? We start out the day like most schools with the pledge and prayer. It’s very important to teach good citizenship! Then we move onto journal time. We journal mostly to practice handwriting, but Liam also practices good grammar and sentence structure. Jack is only in Kindergarten, so I’m not too strict about what he writes. Liam is required to write at least two full sentences. After we journal, we move onto handwriting workbooks. I love Handwriting Without Tears. It’s a very simple program and really helps to correct some of the most common handwriting errors such as writing backwards or writing from the bottom up. I highly recommend getting the teacher’s guide with each grade since it contains a wealth of information. The best prices I found were on the Handwriting Without Tears website. Jack (5 years old) “Letters and Numbers for Me” along with the Kindergarten Teacher’s Guide. He has completed this and has moved onto the 1st grade book. Liam (7 years old) “My Printing Book” along with the 1st Grade Teacher’s Guide. He’s almost done with this book and we’re moving on to “Printing Power” along with the 2nd Grade Teacher’s Guide. After handwriting we do math. I started using Singapore Math because that’s what they use at the homeschool enrichment place we send them. I haven’t tried anything else because I love it so much! I’ve taught K, 1st, and 2nd so far and each year teaches the same thing, just at different levels. It’s also really fun and easy to make Singapore Math really hands on. Balance scales; weight set, linking cubes, a learning clock and we use various household items like different size containers, dice, cards, etc . Now for the fun part…reading and language arts!!!! I’ve used various programs in the past couple of years, so I’ll briefly talk about what I did with each child. When he was 3.5 years old, I started him on Headsprout Early Reading. I absolutely love Headsprout!! When he went to Kindergarten/1st grade, I didn’t homeschool him, so at the school he went to, his teacher used Reading A-Z. I actually have a membership to this site this year. 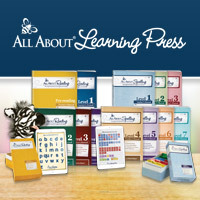 There are tons of great printable books and workbooks. During this time, he also did Headsprout Comprehension (2nd grade-ish level), which again, I loved. This year his reading is basically reading books and writing book reports. For spelling we use All About Spelling. This is a fantastic program! I’m even learning things from it (who knew there was a floss rule?)! Everyone should start out at level 1 no matter what grade you are in. I purchase the Deluxe Interactive Spelling Kit (along with level 1 teacher’s manual and student packet.) and will be able to use that for all of my children. The teacher’s manual is so organized and even tells you proper wording to use so as not to confuse the student. For grammar we use Growing with Grammar Grade 2. This is a really nice, progressive way to teach grammar. Liam does it all on his own. Again when he was almost 4, he did Headsprout Early Reading. This time I even got it at half price since we had already purchased it before! Score! He’s now in Kindergarten, but at a 1st grade reading level. He’s still not ready for Headsprout Comprehension, so this year we delved into the world of Sonlight. This is the only year we’re using this because I think Sonlight starts to become more creation based, which is not what I want to teach my children (absolutely no offense intended to those who teach Creationism; we’re just an evolution family.) I purchased Grade 1 Readers Schedule along with Grade 1 Readers. Jack really likes this schedule and it gives him ample reading practice every day. The books are really cute too. I also purchased the language arts curriculum but stopped using it. One day it would teach possessive nouns then the next it would teach punctuation. It was too sporadic for us. Next year I’m going to move Jack to Growing with Grammar. And for all my children, the library is our best friend! We go once a week to get books and attend story time. There are so many great books to teach science, history, social studies, and on and on. Our afternoons are devoted to Science, Social Studies, and art. We don’t do these subjects everyday but around 2 or 3 times a week. For science we use Magic School Bus kits and books. The kids love, love, love the kits. You can get tons of them from Amazon for cheap. We just finished the Going Green Kit. 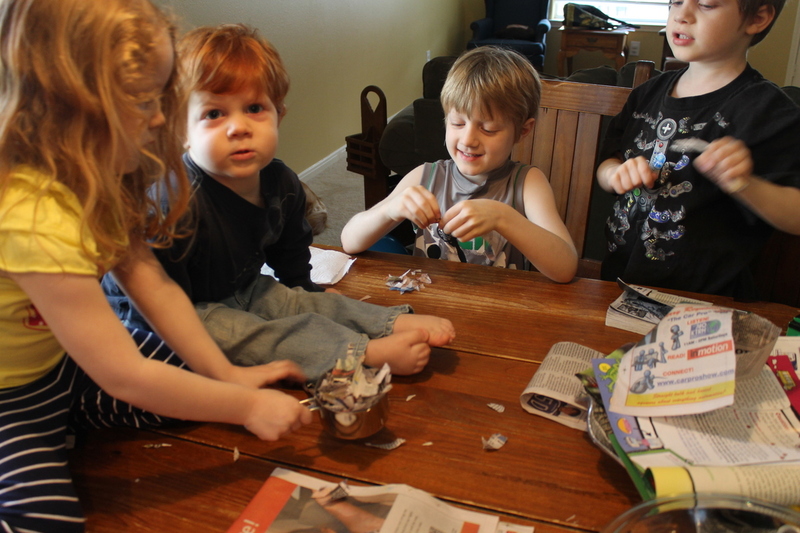 That’s a picture of the kids learning how to recycle paper up there. The books are great too. You can find at least one picture book or chapter book to go along with each kit. Our Social Studies and history is just reading. We love the Magic Tree House series and there are a lot of Usborne books that are great for history and many other subjects. I usually just have these books available and the kids read them whenever they want. Jack and Liam also attend homeschool enrichment class for Science and Social Studies at an awesome school. They go once a week for 3 hours. For art we use Artistic Pursuits. This is the one subject I’m terrible about being consistent with. But we do love these art books when we do them! The kids are learning about different meduims, famous painters and painting, and different techniques. It’s art and history all rolled into one! 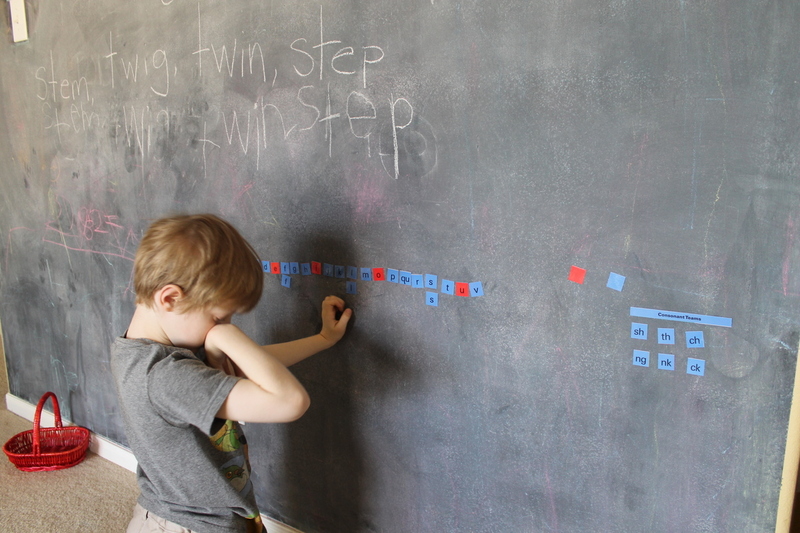 A recap: we start out with desk work that covers math, reading, and handwriting. We are done with that around 11:30am, have a great lunch, then do science and/or social studies and/or art. We’re done with our school day around 1:30pm. And that’s about it! 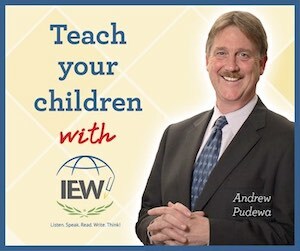 I hope this helps anyone thinking about homeschooling or anyone who’s already homeschooling. Please email or comment on this post with any questions!! Homeschooling pros and cons coming soon! Previous Previous post: Picture Valentine Cards! Your occupational therapy friend loves that you use Handwriting without Tears. It’s a great program for all levels.